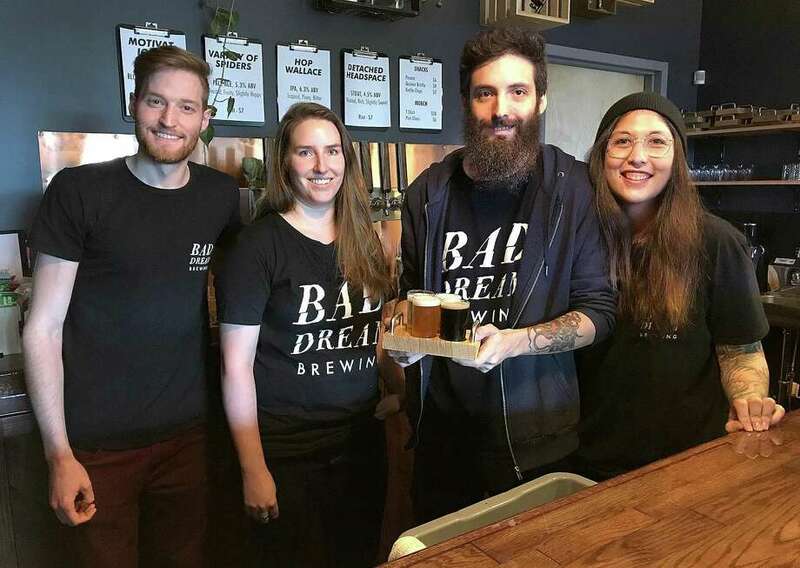 Bad Dream Brewing owners Brian Benzinger, Emily Leone, Max Retter and Michelle Retter stand behind the bar at their newly opened taproom at 116 Danbury Road (Route 7) in New Milford. The Danbury area’s burgeoning micro-brewing scene has added another destination, and it happens to be the first in New Milford. Bad Dream Brewing has opened at 116 Danbury Road in the Fairfield Plaza, which also includes Staples and T.J. Maxx. Bad Dream is a small-batch brewery — utilizing a three-barrel system that makes up to 93 gallons per batch — with a surprisingly spacious taproom that belies its 1,600 square feet. The four owners, all in their late 20s or early 30s, share a passion for beer and books. They used to coordinate a popular book club and started serving their home-brewed beer to guests. That eventually led to the idea of opening a brewery and, after more than two years of planning, the idea has become a reality. Benzinger owns the brewery with Max Retter, Michelle Retter and Emily Leone. Benzinger and Max Retter are friends from their days at New Fairfield High School. All four owners live locally. All four have specialties that benefit the business, Benzinger said. Their backgrounds include chemistry, legal, electro-mechanics and computer programming. The name Bad Dream Brewing comes from the impact of the horror-genre books they have read with the club. They plan to rekindle the book club and operate it out of the brewery starting soon. The owners also take creative liberties when naming their brews. The four they are serving now are Variety of Spiders, Hop Wallace, Detached Headspace and Motivational Poster. Within the last year, the Danbury area has seen its number of breweries grow from zero to five. Redding Beer Co. in Georgetown and Nod Hill Brewery in Ridgefield opened last year, while Broken Symmetry Gastro Brewing in Bethel and Charter Oak Brewing in Danbury opened this year. Bad Dream Brewing held its soft opening the weekend of June 22. Housatonic River Brewing is scheduled to open later this summer in New Milford on Kent Road along the banks of the Housatonic. Also, Reverie Brewing will open soon in Newtown on Church Hill Road. The owners do not harbor dreams of expanding quickly and becoming giants in the beer industry. They do not distribute their brews, although they have permits to do so and keep open that possibility, and their beer is only available at the Bad Dream taproom. They will soon offer growlers to take home. Food is not served in the taproom, but customers may bring their own food or order from Vroom Service, which delivers meals from local restaurants. Snacks are available and made by The First Bite catering business in Brookfield. Bad Dream also serves wine from Sherman’s White Silo Farm and Winery. Spent grains from the brewing process are picked up by a local farmer to be fed to livestock. The Bad Dream Brewing taproom is open from 5 to 9 p.m. Thursdays and Fridays, 11 a.m. to 9 p.m. Saturdays and 11 a.m. to 6 p.m. Sundays. The brewery may be reached at 860-717-4546.